Turbulence is the leading cause of injuries in the commercial aviation industry, costing U.S. airlines over $100M per year in maintenance, safety, and efficiency impacts. Today, turbulence awareness in flight is largely through Pilot reports (PIREPs), which are late, subjective, and not well disseminated to other aircraft. The Turbulence Auto-PIREP System (TAPS) automatically reports turbulence encounters from aircraft, downlinks the reports to the ground, and disseminates the information to aircraft operators and ATC (Air Traffic Control). The software-only system uses sensors and computers currently on aircraft, and existing data-link networks (e.g., ACARS). TAPS reports are processed and disseminated by a server network in real-time to participating airlines within seconds of the report being generated. 98% reduction in unnecessary airframe inspections due to turbulence encounters. Improved awareness of turbulence for dispatcher operations has reduced unexpected turbulence encounters and related injuries. Reduction in aircraft cruise altitude changes due to uncertainty of turbulence along flight path. Fuel savings over many flights lead to significant cost savings and lower emissions. Technicians use TAPS reports to determine whether to inspect aircraft after turbulence encounters, meteorologists use the data for enhanced forecasting, and the NTSB has used TAPS data in accident investigations. TAPS reporting code has been installed on over 500 aircraft (B-737-800, B-757-200, B-767-300ER, B-767-400ER, A320 and A330). The aircraft have been broadcasting turbulence reports in revenue service, and reports have been made and received from throughout the world. Recognizing the importance to the forecast community, an estimation of eddy dissipation rate (EDR) was added to the TAPS data stream in 2005. 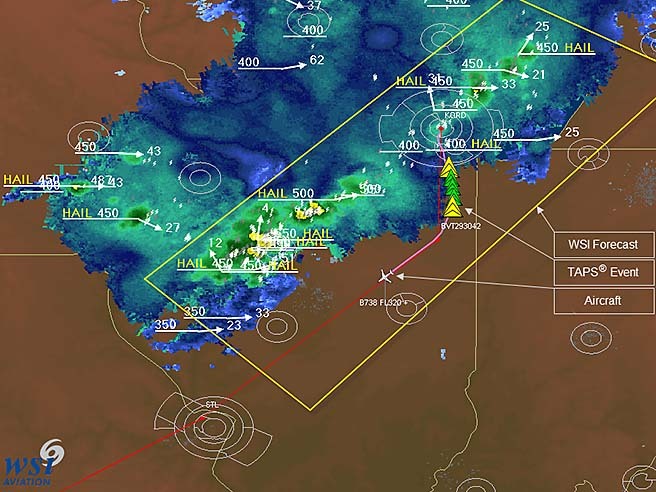 In 2010, TAPS report data was integrated into Weather Service International's (WSI) suite of cutting-edge flight planning and flight following tools. These tools provide airline dispatchers, for the first time, with a real-time integrated picture of turbulence encounters, weather, and aircraft position, allowing them to communicate with aircraft to avoid encounters. TAPS reports are integrated into the dispatchers’ flight following displays (e.g., WSI's Fusion™ product). 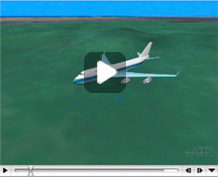 They are displayed as small icons as shown in the picture below in a highly interactive real-time display of turbulence encounters. At the top is a snapshot from Fusion from an actual turbulence encounter as depicted by TAPS. • Reduced costs by avoiding unnecessary maintenance. • Reduced injuries to flight attendants and passengers through enhanced turbulence awareness. • Improved collaboration on turbulence hazards and flight changes between pilots and dispatchers/controllers. • Improved ability to select altitudes that best balance the need for flight safety (least turbulent altitude) and operations efficiency of the aircraft (optimal cruise altitude). • Enables more judicious use of airspace and can lead to potential savings in fuel and reductions in flight delays. • Inclusion of EDR assists meteorologists in validating and/or enhancing their weather forecasts. "Our rate of severe turbulence events had gone down, especially with the aircraft that have TAPS. We got a more timely alert for that type of activity, and therefore avoided it." "Together with TAPS, the enhanced turbulence radar effort marks one of the most exciting developments in the struggle to deliver better quality turbulence hazard information to flight crews and potentially other aviation user groups."